Most people associate hemp with its relative marijuana. What most people don’t know is that hemp has a long list of uses throughout its history and none of them are to do with getting high. That’s because hemp is low in THC (tetrahydrocannabinol). THC is the natural chemical that gives marijuana its psychological effects and stimulates dopamine (hence the term dope). Marijuana contains 5-20% THC while hemp has only 0.5-1%. Hemp comes from the Cannabis sativa L. species which has many varieties. It has a high cellulose content which helps make it so versatile. Industrial hemp developed for fibre can be used to make paper (which is longer lasting and doesn’t yellow as wood-derived paper does, and requires less bleaching), rope, string and fabric (which has good warm and cold insulation qualities like cotton). Hemp developed for oil can be used as an alternative to fibreglass, petrochemicals and plastics. It is also renewable unlike fossil fuels. Hemp oil is also found in paints, lubricants and is widely acclaimed for its skin care and general health benefits (high in essential fatty acids and supports the immune system). Hemp oil mostly comes from the seed although the whole plant can be pressed to extract oil. Chinese uses for hemp date to 10,000 B.C and George Washington grew it. It has great many uses. 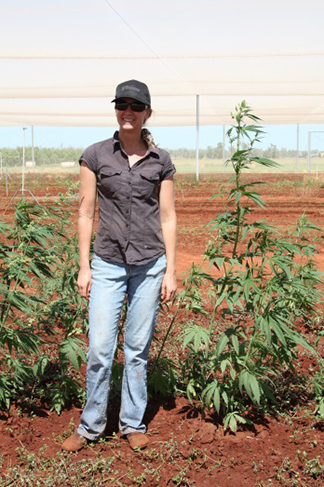 Hemp is one of the crops that was planted at Katherine Research Station under the diversification banner. It’s being planted across three dates, each two weeks apart. It’s expected that in the Katherine climate it will take 100-150 days to grow. In other climates hemp takes longer to grow due to shorter day lengths. Three varieties have been planted—two grain varieties and one fibre variety. Three replications are planted on fallow soil whilst the other three replications are planted in soil that grew last year’s peanut trials. 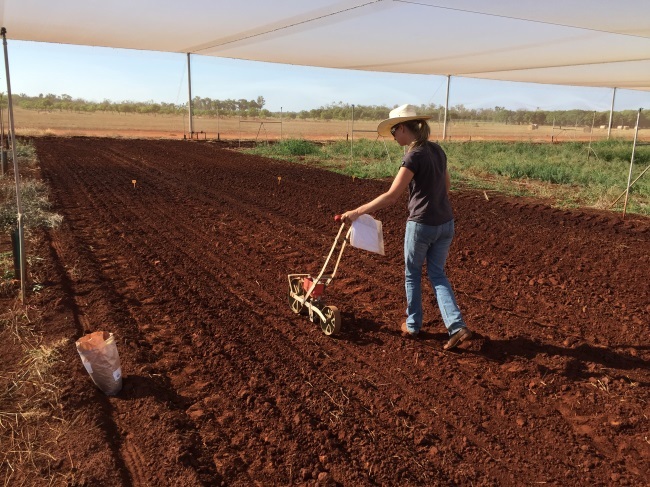 The outcomes of the trial aim to produce viable yields that are easily managed with good returns and the potential for it to be a rotational crop. Hemp is a prohibited plant and is not normally permitted to be grown in the Northern Territory. To conduct research trials DPIF have gained permission from the Department of Health.